“The Four Immigrants: An American Musical Manga” is making a good impression in its world premiere presented by TheatreWorks Silicon Valley. Created by Min Kahng, who wrote the book, music and lyrics, it tells the story of four young men who emigrated from Japan to San Francisco in 1904 with big dreams. TheatreWorks artistic director Robert Kelley calls it a companion piece to “Rags,” the musical about Jewish immigrants in New York at about the same time. Kahng says he was inspired to write the musical after finding a copy of “The Four Immigrants Manga,” a comic book by Japanese-born artist Henry Yoshitaka Kiyama, who studied in San Francisco. Manga is a Japanese cartoon style from the late 19th century. 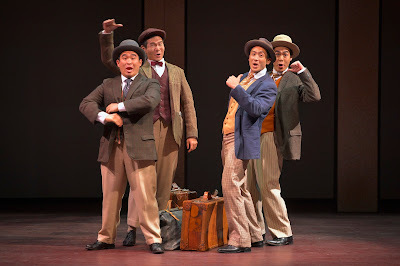 The four immigrants in the musical are Charlie (Hansel Tan), a perennial optimist; Fred (Sean Fenton), who wants to be a farmer; Frank (Phil Wong), who’s not too bright but who wants to own a shoe store; and Henry (James Seol), an artist presumably based on the comic book’s creator. All other characters in this all-Asian, multi-talented cast are played by four women: Rinabeth Apostol, Kerry K. Carnahan, Catherine Gloria and Lindsay Hirata. The show covers two decades with such events as the 1906 earthquake and fire, the 1915 Panama-Pacific International Exposition and World War I. Along the way, the men experience surprises, success and disappointment. The biggest obstacle they face is prejudice and discriminatory laws such as a 1913 measure that didn’t allow Asians to own property and another that barred them from citizenship. In 1924, the year that the musical ends, the federal Immigration Act barred entry by people from a wide range of Middle Eastern and Asiatic countries. It was even more far-reaching than current attempts to keep out people from six mostly Muslim countries. However, the show focuses less on politics than on the men’s stories, told through tuneful music in a variety of styles, such as vaudeville and ragtime. Well-executed, terrific choreography by Dottie Lester-White greatly adds to the show’s pleasure. It’s also enhanced by Noah Marin’s costumes, Andrew Boyce’s fluid sets, Steven B. Mannshardt’s lighting and Jeff Mockus’ sound. Opening night on July 15 was delayed 15 minutes because of computer glitches, affecting some of the projections created by Katherine Freer. Their absence wasn’t apparent, and the show moved smoothly. The show is well directed by Leslie Martinson, the company’s associate artistic director and casting director. Orchestrator and musical director William Liberatore conducts the five-member orchestra from the piano. Running more than two hours with one intermission, “The Four Immigrants” is a rewarding, winning theatrical creation that no doubt will find its way to other stages throughout the country. It will continue through Aug. 6 at the Lucie Stern Theatre, 1305 Middlefield Road, Palo Alto. For tickets and information, call (650) 463-1960 or visit www.theatreworks.org.